Any slip and fall incident can cause injuries, but a fall from a height often leads to catastrophic medical issues—and even fatalities. In fact, the National Safety Council reports that following highway accidents, a fall from a high place is the "second leading unintentional workplace fatal event." It's more heartbreaking when fall injuries were caused by negligence on behalf of a property owner or business, and therefore possibly preventable. Victims can be off work for months or longer while they recover from fall from height injuries, or suffer disabling conditions that prevent them from working at all. If you or a loved one is the victim of fall from height injuries due to negligence, you might benefit from the expertise of slip and fall accident attorney. He'll be able to determine the parties responsible for your accident and seek compensation to aid in your recovery. While some falls from heights happen when a person isn't careful, many more are caused by failure to keep properties safe and maintained, or to post warning signs of hazards or pending repair. It's the responsibility of a property manager, a property owner, or a business to follow a duty of care for workers and guests. Stairs. Broken stairs and loose or missing handrails often result in devastating falls. These accidents are also caused by inadequate or no lighting, which makes it impossible for someone to see the potential dangers of using a staircase. Windows. Children are especially at risk of falling out windows left open or that are defective. These tragic accidents can occur at a friend’s or family member’s home when children aren't properly supervised, or when landlords or property owners fail to maintain or replace the windows or screens. Porches, decks, and balconies. These structures might collapse if not constructed according to building codes or not adequately maintained. People also fall off these platforms because of loose or missing railings. Once the cause of the incident is determined, a landlord, homeowner, contractor, or other entities could be liable for compensating victims. Roofs. If workers aren't provided with adequate fall protection or trained correctly, or the structure they're standing on collapses, the result is tragedy. Ladders. People often fall from these when they're not properly supported or they're not the right height for the task. If ladder design or manufacturing defects caused the incident, a victim could have a product liability claim against the manufacturer. Construction sites. Falls from heights are major dangers for individuals working on construction sites, and are one of the leading causes of workplace deaths. They can occur from scaffolding, cranes, forklifts or other heavy machinery, or open holes in flooring. 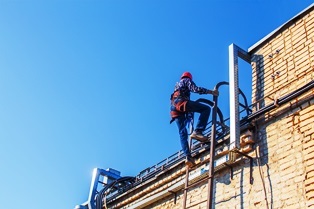 Workers are often at risk when not provided with sufficient fall protection or their equipment is defective. Many parties might be to blame for these falls, and an employee could have workers’ compensation and third-party negligent claims. Did you or a loved one suffer a fall from a high place in San Diego or southern California? Attorney Mark Blane is an experienced slip and fall attorney who will thoroughly investigate the cause of your accident and fight to hold all responsible parties accountable. He handles these cases on a contingency fee basis, which means you won't owe any attorney fees until he settles your claim or wins at a jury trial. To learn more about how he can assist you, call our San Diego office today to schedule your free case evaluation.